While training rooms are mostly rented for serious learning, you can also rent a space for fun-filled activities. Modern-day businesses seek new techniques for workforce training, and gamification is the new method used by them to accelerate learning among employees. So, if you want to learn how employees can learn better through games, this post will help you plan something exciting for your employees. As highlighted by Daniel Burrus, kids aren’t the only beings to learn from games. These days, interactive gaming has been utilized as a tool train the workforce. 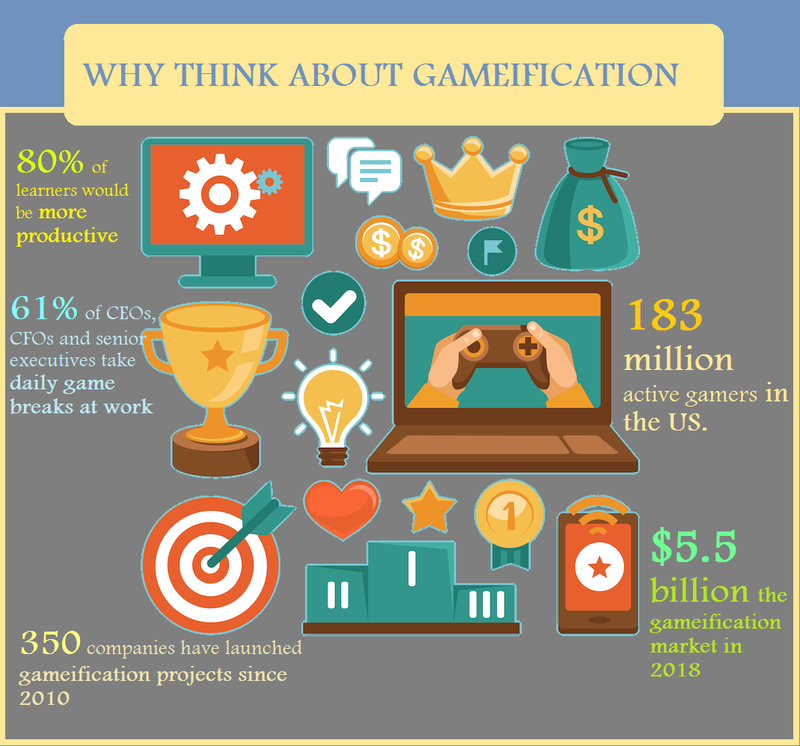 Gamification has 5 basic elements that can be implemented together to optimize learning. Training modules should be immersed, interactive and competitive, enabling you to understand individual’s skills and progress. Self-assessment allows a trainee to keep track of his progress. As he logs back in, he can rejoin the training from the point where he left off. Takeaway: Plan a training course that allows groups as well as individuals to compete in a classroom, and motivate them to go beyond their respective targets. Employee training will give you better results if the trainer and the training material enable participants to interact, rather than sitting passively. Interaction is the main function and purpose of gaming. Through gamification, participants can interact with the system, use information provided and use it to achieve their targets. Takeaway: If your training material is all about information through lectures, make it more interactive by involving employees in role-plays, presentations, simulation and more. You can try it out in a seminar room rental space as well. 3D gaming is increasingly popular these days. It’s entirely different concept of giving information. The gamer becomes part of the environment and finds relevant information. Simulation technology is not new, yet it’s expensive and scarce. But you can always think about this method. Takeaway: Immersed training improves engagement and offers better learning. This is really important. Bringing competition into training motivates participants to go forward briskly. However, typical, one-on-one learning is not as competitive as it should be. Employees know when they should improvise – after certain period. Until then, employees will not be as active as they should be. Eventually, the results of training vary a great deal and there may be many issues highlighting the weaknesses in it. Takeaway: Training material and training time should be calculated. Introduce competition at all level so that employees remain active right from the beginning. There’s no need to mention, you’re all focused on the screen while playing games. This is the real impact of gameification and that’s what you should expect from trainees – 100% focus and concentration in training. Plus, it is the sum-total of all the inputs mentioned above. However, this is not possible with traditional means and methods. Takeaway: Your training material must have actionable points, scenarios and situations forcing participants to learn by solving problems and raising their skills step-wise from beginners’ level to professional level. So, your training material should have interactivity, focus, self-diagnostic, immersion and competition. All of these elements are present in state-of-the-art Training Room SG. Contact Us if you need to rent a training, seminar or classrooms. This entry was posted in General on November 30, 2015 by .